Hello, I am trying to center my navigation bar on my website and everything I have tried isn't working. I have no idea whether I should edit the HTML/CSS code so if you can include a full description that would be most appreciated! This didn't work, any other suggestions? This edits the section on the top with "log out" "user CP" etc. ^ are you using different themes for guests & members ? (04-29-2015, 08:58 AM).m. Wrote: [ -> ] ^ are you using different themes for guests & members ? 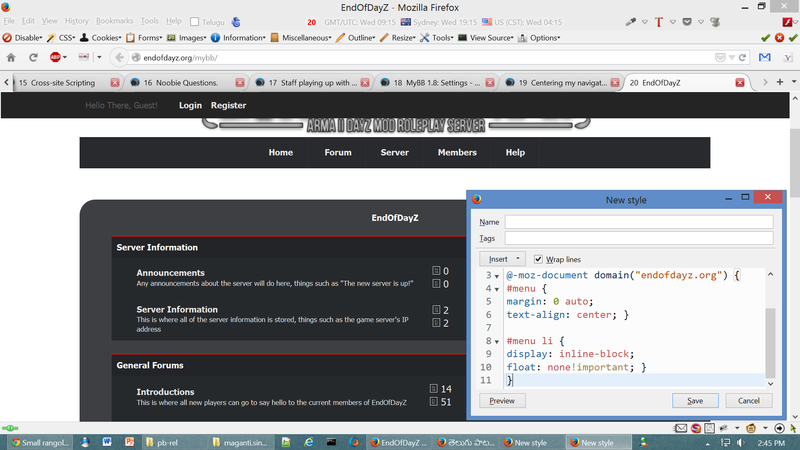 @EndOfDayZ just scroll down global.css or use the search option (Ctrl+F) to find #menu (it is found after .jqi .jqiarrowrb).... and do the changes as said in Post#5 by .m. Hello, the navigation bar is no centered, thank you however before home there isn't a thin grey line to differ the "Home" button to the rest of the navigation bar. Could you explain how to fix this.